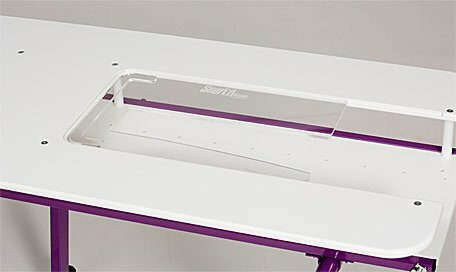 You can use additional machines in your SewEzi Portable table by purchasing extra acrylic inserts for each sewing machine. Each insert is cut to the shape of the free arm of the sewing machine and places the machine in the correct position for sewing. When you place your order, please provide us with the make and model number of your machine in the comments section of the order. Alternatively email us at info@cottagequiltingonline.com , or call us toll-free at 1-866-457-8458. If there is no model number and only a name, do not worry, SewEzi has a database of thousands of sewing machines, and we will track it down for you. We may also request a digital image of your sewing machine to aid us in locating your specific sewing machines details. Please note that the 4-digit code on the acrylic insert received from us is a SewEzi code and does not relate to the model number on your machine.